A UCF student is in critical condition after being struck by a vehicle near campus on Thursday night, according to multiple reports. Troopers say at about 9:55 p.m., 19-year-old Mariana Bornacelli was running across the street near the intersection of Alafaya Trail and University Boulevard when she was struck by a four-door Nissan, News 6 reported. She was not at a crosswalk or intersection when she entered the vehicle’s path, according to News 6. 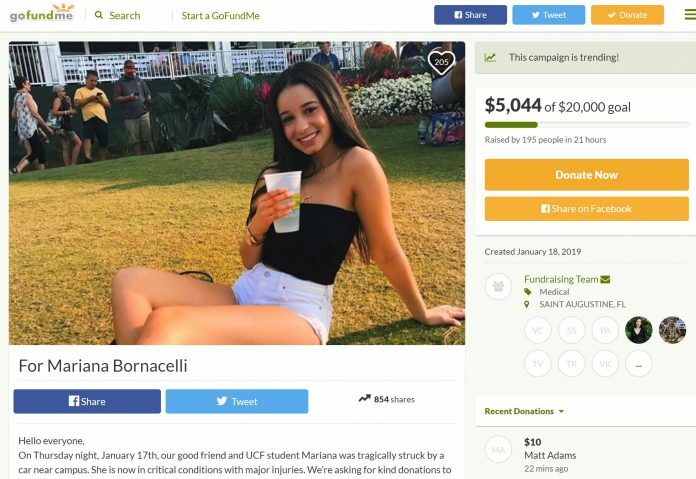 Bornacelli was transported to Orlando Regional Medical Center in critical condition, according to a Go Fund Me being shared by several Greek students. The driver of the Nissan, 24-year-old Sultan Alanazi, was not injured and is not facing charges at this time, News 6 reported. Authorities have determined that alcohol was not a factor in the incident, according to News 6. Knight News received a statement from the GoFundMe organizer and childhood friend of Bornacelli, Valerie Calderon. Calderon’s fundraising efforts are supported by her and two other lifelong friends of Bornacelli: Savannah Summers and Patricia Arance Sanchez. Check back for updates as this story develops.